Seen from an economist’s perspective, traffic congestion is a wonderful thing to encounter in a big city. Increasing congestion is even better, because these are symptoms of a busy and growing economy. The city is, first and foremost, a place of trade. Cities must be planned for economic activity as a priority, because without trade the city quickly dies – as can be seen from sad and shrinking post-industrial cities all around the world. But congestion is also the enemy of the city, because it reduces its convenience and attractiveness as a place for business, and because it reduces productivity and profitability due to time lost to congestion. Traffic congestion and management have been challenges since cities began – almost 11,000 years ago. The earliest cities of the Middle East are known to have had one-way streets, parking laws and hours of access. Throughout history, in countries all over the world, the job of dealing with traffic usually evolved through three different stages. It begins with the Big Town Stage that consists of a collection of buildings and streets that need better streets and traffic controls. This phase is usually overseen by engineers who know how to get things built to get things working. Places grow and reach the City Stage, which consists of a complex mixture of uses, different modes of public and private traffic – all operating within a unifying administrative system of engineers, planners and managers. The largest scale is the Urban Region Stage which consists of an extensive area – a city and surrounding towns – that act as a constantly evolving economic unit meeting the needs of many groups, often consisting of contradictory values and expectations. This stage needs very different levels of operation, control, planning and success with the key differences arising from how the Urban Region is governed. Dublin is crossing the threshold between the City Stage and the Urban Region stage. Most of its recent problems are symptoms of this transition in which we try to use old approaches to fix newly emerging problems. 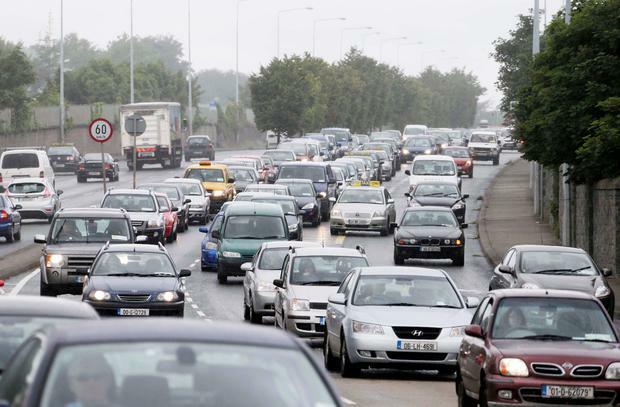 Dublin – like most Irish cities – is emerging from a system dominated by road engineers trying to solve every problem by building a new road or rail line. Traffic is increasingly thought of as being something that needs to be systemically managed by employing a wide range of tactics that include increasing public transport or using land-use planning to reduce the need for journeys. In other countries, traffic management is also extending to behaviour modification through carbon taxes and charging for use of busy central urban roads – as is happening with congestion charges in cities like London and New York. In most countries the transition from road planning to traffic management usually involves the emergence of a traffic planning agency – as has happened in Ireland with the establishment of the National Transport Authority which undertake Dublin’s strategic planning of transport – including all public transport infrastructure investment, as well as the management of traffic. This type of work becomes complex in growing city regions because of the need to co-ordinate many local authorities. It also becomes difficult because the ‘remoteness’ of a big agency makes it difficult to engage with the very local sensitivities that emerge when private property or local amenities are affected by big projects that serve the whole region. Dublin has seen recent examples of this difficulty, as shown by decisions to change the extent of the Metrolink project, the opposition to the Bus Connects project and the objections to impacts on sports facilities off Mobhi Road. As the transport needs of a growing city region increase, these types of conflicts between local sensitivities and regional needs only increase. Indeed, in the not-too-distant future, these current difficulties will be nostalgically recalled as minor, compared to the scale of disruption and land acquisition that will be required for the tunnels, trains and transport systems that will be needed for a city region of over 2m people. Really successful management of city transport needs very bold, big plans. Making such plans is the business of engineers and planners, but delivering such plans is not. Implementing very hard decisions in a city of many, many groups needs the skills of professional politicians. Criticising politicians and politics seem to be one the few bloodsports that is still socially acceptable. But it must never be forgotten that politics is the means by which a society has difficult conversations with itself. Politics is about how we can all agree to do difficult things. “Politics is the art of the possible, the attainable – the art of the next best,” according to the famous 19th Century German diplomat Otto von Bismarck. The attainment of the highest and most effective type of city region needs a type of governance that can only be delivered by political leadership that has a direct mandate from those people who will be affected by these big difficult decisions. Local city governance is needed for decision-making and delivery of large-scale visions for traffic, utilities, amenities and housing. Governance is the key to creating and maintaining a competitive, attractive and successful city region. Most countries eventually learn to accept that the key to solving the challenges of growing city regions is to give them autonomous self-governance – usually under a directly elected mayor with tax and spend powers. Ireland is at the stage of exploring this next stage. Cities can become ‘stuck’ at this transition until the political system understands and accepts the need to change governance. Politics can be slow to accept and initiate change that involves a dilution of power. It is particularly difficult in highly centralised states like Ireland – where political reluctance is facilitated and assisted by a highly centralised professional civil service. Cities can experience decades of blight before the pain of remaining unchanged becomes less than the pain of change.